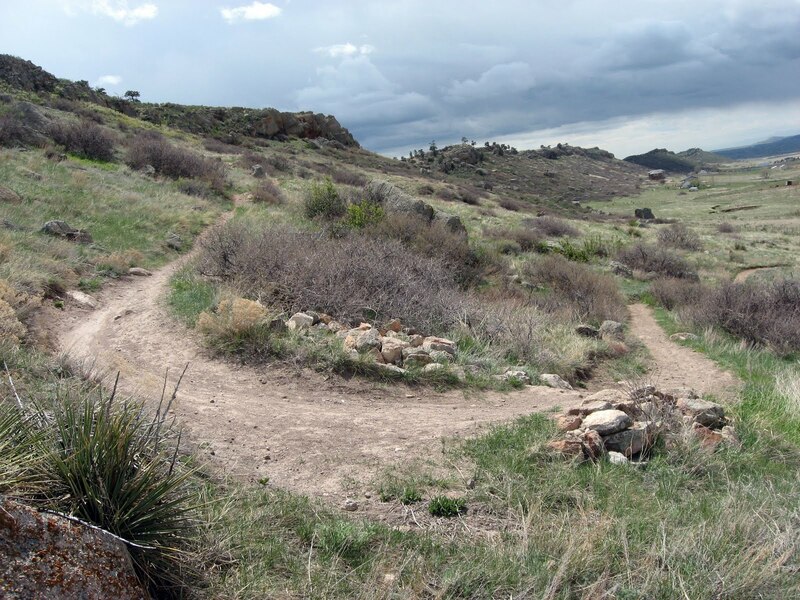 Switchbacks can be the most challenging section of a mountain bike trail, and if there are some rocks and roots thrown in, they can be nearly impossible if you don't know the secret to riding them properly. For those who don't know, a trail is said to "switchback" or have a "switchback" in it when it turns sharply back upon itself, usually while climbing or descending a hill. Most classic switchbacks execute a complete 180 degree turn. Some of them may be big and shallow like the one in the upper left of this post, or they may be sharper and steeper like the one on the right side. The "secret" to riding switchbacks cleanly is really no secret at all, as I have already written about it. In a phrase, it is this: "Wherever you are looking, that's where you will go." When you are riding a switchback, however, it can be tough at first to remember to look where you want to go, because the trail appears to reach a complete dead end. Obviously, you can't keep looking straight ahead into the forest, because that is where you'll end up. You can't look at the part of the turn where your wheel is, because you won't know what is coming at you from even two feet ahead. Rather, you must look all the way through the turn, and crane your head around to see the section of trail that you want to end up on. Imagine, for instance, you are riding the switchback pictured above and to the right. First, you must look at the turn as it approaches. When you get near it and your front wheel begins to enter it, you need to pull your head hard to the inside of the turn (in this case, left) and look through the turn and up to the section of the trail above you. At first, this may feel very disconcerting as you aren't looking at the front wheel of your mountain bike at all, and aren't even looking in the same direction as your current path of travel! As your mountain bike is about in the middle of the switchback, you should be basically looking straight along the upper trail after the switchback. In about one second, your bike will swing around and catch up with your line of sight, and you'll be ready to rock and roll, having successfully ridden the turn! You will notice that my head turned, looking through the turn and up to the trail above it, faster than my front wheel turned. Basically, my head led my wheel as it turned. I was able to look straight along the upper trail before my front wheel was pointing that direction. If you watch closely, you will notice that the camera stopped turning while the bike still was, and that my front wheel swung around and caught up with my line of sight. This effect of the front wheel lagging behind becomes even more pronounced the sharper a turn is. Generally, going up a switchback is much more challenging than riding down one, which is why I've talked about climbing up to this point. Descending switchbacks generally seems much more natural, although the same technique still applies. The only difference is you don't have to worry about providing the momentum to get the bike through the turn, or getting your front tire up and over a root or rock. The technique of "looking through the turn" really comes into play on downhill switchbacks that are very, very steep and sharp. These would be the kind of switchbacks that would be impossible to climb up, simply because they are so stinking steep! When riding one of these switchbacks, I tend to almost come to a complete stop as I try to inch my front wheel around the outside of the turn as my back wheel stays in basically the same spot. Then, the bike seems to reach a tipping point, where all you have to do is shift your weight downhill to the inside of the turn, and you ride out of it and continue on your merry way. Click here to read about an advanced descending technique. Keep your eyes peeled for switchbacks as you are descending. Again, switchbacks require you to slow down drastically, sometimes almost to a complete stop. If you are screaming down a sweet singletrack descent, it is imperative that you are constantly on the lookout for switchbacks. A switchback that catches you by surprise will cause you to leave giant skid marks in the trail (which precipitate unnecessary erosion), at the very least. As a worst case scenario, you won't have enough time to stop, and will go flying off of the end of the switchback into whatever is on the other side, most likely causing a crash. If this is a tree, a steep hill, or a cliff, the result could be serious injury or death. As trek7k of Singletracks.com reminded us yesterday in his blog post, mountain biking is a dangerous sport! For instance, I was flying downhill during my first ride ever at Stonewall Falls in Clayton, Georgia on what had been a long, fairly straight downhill. 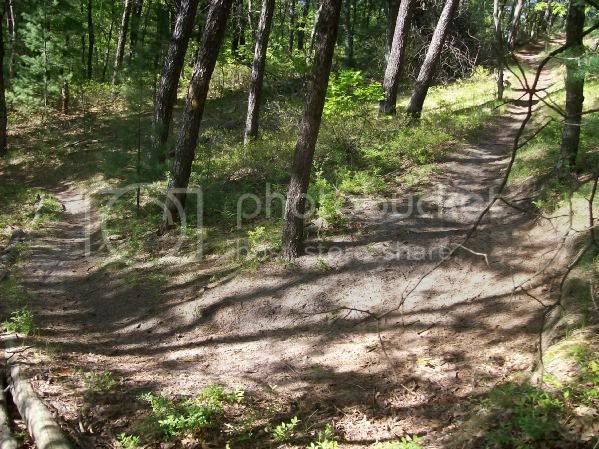 As I entered an open area with tall blackberry thorn bushes encrouching on the trail, the tread quickly became rocky and somewhat washed out. As I rounded a slight bend in the trail, I looked ahead and saw a wall of thorns! The trail took a sharp 100 degree turn to the left (it wasn't even a full switchback), and though I tried to stop, I didn't have nearly enough time! I flew off the turn (which dropped off on the other side), and ended up face-first in the thorn bushes with my bike on top of me. It took me almost five minutes and a lot of needle pricks to extricate myself from the thorns. I paid for my speed in blood, but luckily escaped without any serious injury. The moral of the story: keep your eyes up, and ride in control at all times! What have your experiences with switchbacks been like? Do you have any advice to share with someone new to riding switchbacks, or do you have any further questions on switchback technique? Please feel free to share your questions and advice below! Be sure to round out your arsenal of Mountain Bike Skills by reading the rest of the series here. I have a few tips for switchback riding, ones that I have found to be useful over the years. 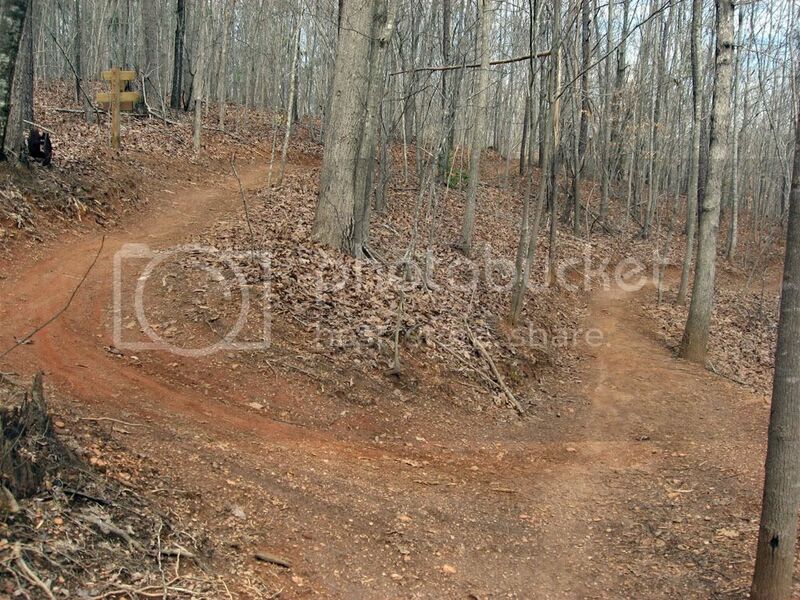 1) Start on the outside edge of the switchback...the inside of the turn tends to be the steepest. 2)As you reach the middle of the switchback, you should be gradually moving to the center of the trail, so that by the time you exit the switchback, you are in the dead middle. Obviously this can vary depending on technical obstacles that may exist on the switchback. 3) Pedal smoothly and in a gear that will allow you to get up and over things that may be on or just past the switchback. Nothing worse than coming across a log at the top of the switchback and having no steam or being on a wrong gear. Shift before you even start into the switchback. 4) Keep your weight neutral front to rear, as much as possible. This will help smooth out steering and maintain the best traction. Great video illustration Greg - now I get the camera angle from the video the other day... good job. I'd definitely second slowing on the descent before entering the switchback... at times you do have to come to an almost complete stop in order to navigate step sharp switchbacks safely. On the uphill, Bill above me nailed it - get yourself in a gear you can power through any roots/rocks/logs that may be either in or above the switchback - you need to keep that momentum moving forward or you'll stall right out. Bill, Very good points! Thank you for mentioning them and adding depth to the post. Staying to the outside of the turn is so definitely key! @ eastwood, thanks dude, glad the video clips made it happen! I find just the opposite, that uphill ones are easier to ride than downhill.